The official or technical start to summer hasn’t even arrived yet, but we are deep into summer at Sturbridge Yankee Workshop! 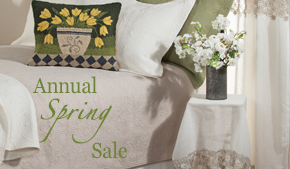 As part of our summer sale, we offer special savings on all of our pillows (not just those made in the USA) and this week we are featuring five new ones to add to your collection and summer home accents. You can find these and more in our print catalog and online – happy summer shopping! 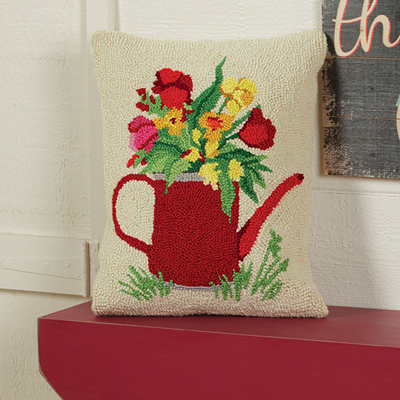 Bright blooms are beautiful additions to this red watering can, portrayed wonderfully in hooked wool. This Sally Eckman Roberts pillow is perfect on a bench or chair to greet summer guests in an entryway or for creating a cheerful statement in a sitting room this season. Display throughout the year as a summery reminder or to coordinate with floral decor. This stylish seagull won’t bother you on your summer days, but he will add comfort to both indoor and outdoor spaces throughout the season. Crafted out of Climaweave™ polyester, this home accent is mildew and water resistant, so even after the occasional summer storm he will still look like new on patio furniture or a country chair. 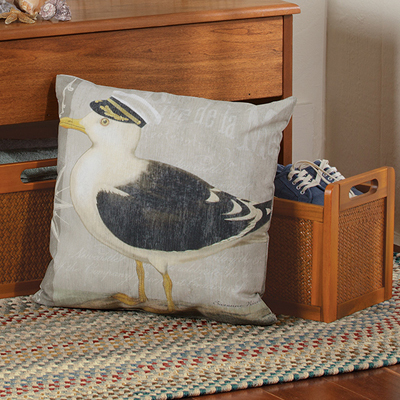 Keep Captain Skipper company with Sailor Gill, or simply coordinate with beach decor and coastal home furnishings. Speaking of the coast, our favorite locations to decorate with in the summer are those that sit on the rocky Maine border with the ocean. 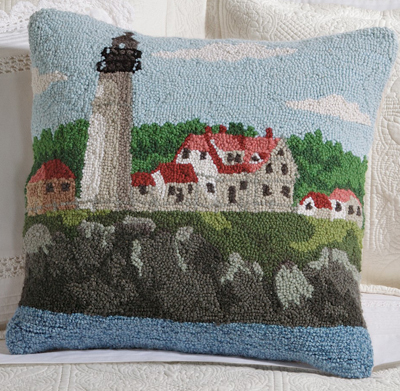 One of the many prides of Maine is the Portland Head Light, and Carolyn Bucha has beautifully adapted the scenery to hooked wool for adding a Vacationland look to your chairs, a sofa or bed this summer. 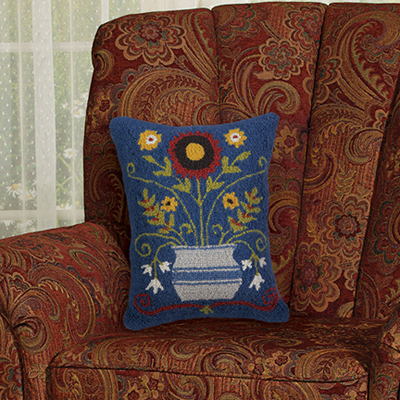 A classic look for any home, this folk art inspired hooked wool pillow is the perfect addition to your most comfortable rooms. Its summer blues, greens, reds and yellows provide a pop of color among other cheerful home accents throughout the season and throughout the year. The vertical shape enhances the visual appeal as the hooked wool complements timeless country furnishings and decor. 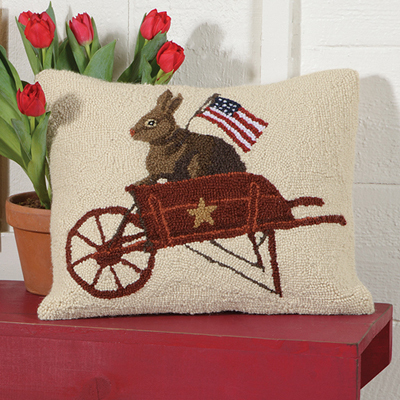 While many of our new pillows follow our USA summer theme, this bunny pillow is a charming way to express your patriotism in a more subtle way, if you decide to incorporate different styling aspects into your home decor (like vintage carts, animals, and so on). The brown bunny cheerfully sits in a garden cart, as the American flag waves beautifully above – a charismatic expression of American spirit and style throughout the summer and all year long. Our 2016 Summer catalog is on its way to you, and inside you will find a variety of made in the USA home accents (all on sale), outdoor decor and special savings on all pillows. The following are five must haves for summer and all year long, and if you can’t wait for the print catalog to arrive in the mail, you can always browse the online catalog here. Happy shopping, and happy summer! Grab a book off of your summer reading list and get comfortable in our new Stafford Glider & Ottoman. 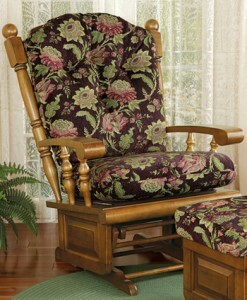 Available in our customer favorite Stafford floral prints, this Glider and Ottoman are made in the USA and offer timeless style in any room. Rock back and kick your feet up all summer long! Also made in the USA is one of our many new indoor/outdoor pillows. The American Flag Pillow was designed in the shape of the United States flag, and its vibrant colors make a patriotic statement on any patio furniture as well as a country chair inside your home. 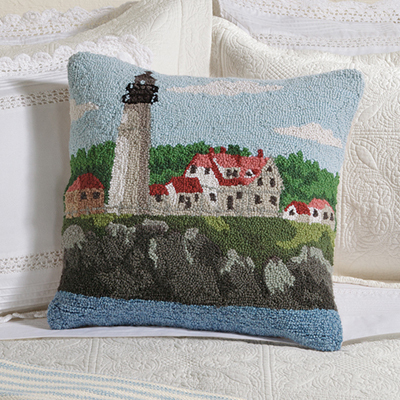 Another new pillow we are excited to be offering this summer is our Portland Head Light Hooked Wool Pillow. With the country charm and comfort of hooked wool and a beautiful reminder of one of our favorite places in Maine, this is a must-have pillow this season. Artist Carolyn Bucha did an exceptional job with the details and colors, portraying an honest look of Portland Head Light. 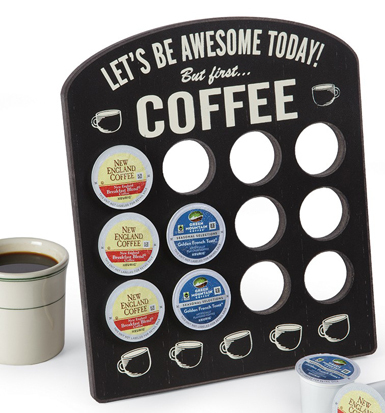 Nearly as exciting is the new Coffee Pod Holder, touting a positive message of “Let’s be awesome today!” while you brew your single serve coffee. This holder will store twelve pods at once so you can keep your coffee near the coffeemaker for convenience every morning. Lastly, this week’s must-haves conclude with one of our new mermaid home accents. 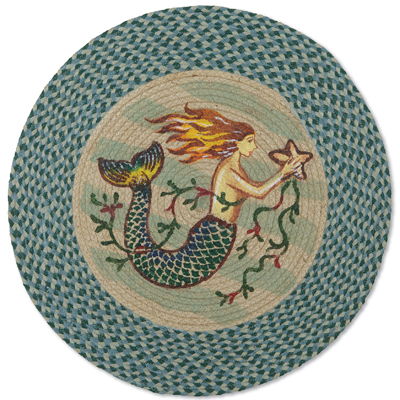 This beautiful round jute rug by artist Phyllis Stevens adds style and protection to your floors, and the beautiful blues surrounding a mermaid and her starfish add coastal appeal all summer and throughout the year. Decorate your home with all of these home accents the above must-haves for a charming summer inside your home and out!